A WOMAN cyclist has been crushed to death by a lorry in front of hundreds of commuters on their way to work. 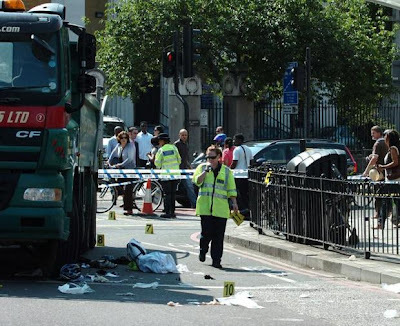 These images show the scene after a woman, in her 30s, fell under the front wheel of the lorry as it turned left from Clapham Road into Harleyford Street, by Oval Tube station. Witnesses said she became trapped between the lorry and railings at the height of morning rush hour, just after 8.30am yesterday. She was rushed to hospital but died a few hours later. 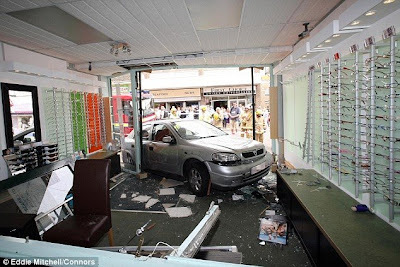 A Scotland Yard spokesman said the driver was arrested at the scene on suspicion of causing death by dangerous driving. (i) Just look at those lethal railings in the photos. They may or may not have had a role to play in this latest fatality but nevertheless railings at every road junction in Greater London (spot the railings in the last pic in my lorry post below) need to be torn up AS A MATTER OF URGENCY. They are quite literally death traps for any cyclist caught between them and a heavy goods vehicle. (iii) The police could play a major role in making our roads safer by cracking down on lawless drivers, lorries flouting the law (like the one in the Boris incident, with doors held together by a coat hangar) and enforcing Advanced Stop Lines. The Met is signally failing in its duty of care to vulnerable road users, and it’s about time London’s cycling community vented its dissatisfaction outside New Scotland Yard. London Cycling Campaign has criticised Road Safety Minister Jim Fitzpatrick for failing to implement measures to protect vulnerable road users from lorries. In a letter to LCC this week, the minister confirmed he has no plans to speed up the fitting of Class VI safety mirrors, nor to ensure lorry driver training will make them more aware of cyclists and pedestrians. 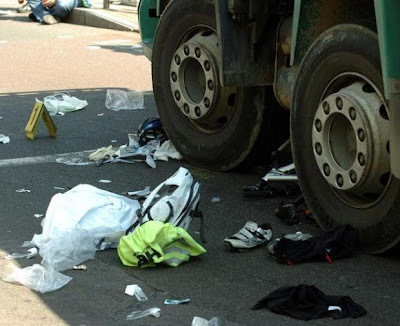 The letter from the minister came days after another London cyclist was involved in a fatal collision with a heavy goods vehicle in Greenwich on 15 May 2009. LCC has long campaigned to speed up the fitting of Class VI safety mirrors to all HGVs. These mirrors give a view of the road directly in front of the driver’s cab, and are proven to reduce cyclist and pedestrian casualties. Under the current programme, most UK lorries will not have these mirrors until 2014. I don't know which office Jim Fitzpatrick hangs out in (it shouldn't be too hard to find out) but I think we need 500 cyclists to turn up outside it to send him a message. I was quite excited when I caught up with this lorry on Willow Walk E17. The vehicle had a notice warning cyclists not to undertake, and another notice on the driver's side warning of the driver's restricted visibility. Admirable! And very useful too, since when the lights up ahead turned to red at the junction with Selborne Road, the driver went into the Advanced Stop Line for cyclists and didn't signal whether he was turning left or right. As many as 85 per cent of lorries break 50mph speed limits while more than three-quarters exceed 40mph limits, Government figures out today showed. Liberal Democrat transport spokesman Norman Baker said: "It seems the police and the Government are now prepared to accept lawbreaking on a massive scale. What do you mean, 'now'? They always have been, Norman. 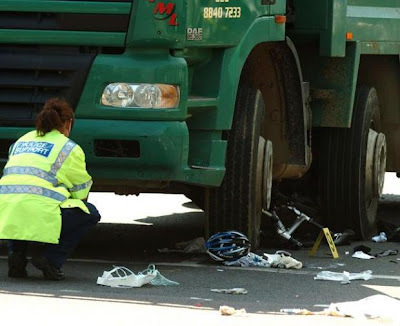 Could there possibly be a connection between the number of collisions involving cyclists and lorries, the widespread lawlessness of lorry drivers, and the reluctance of the police to enforce traffic laws that protect vulnerable road users? This blog thinks there might well be. 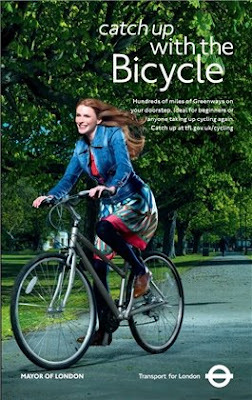 Here she comes - Transport for London's model cyclist. And here's what awaits her when she wants to lock her bike up. (Storey Road E17, Vernon Road E17, Mission Grove E17, High Street E17, Mission Grove E17) All pics taken in the last 48 hours. G4S boasts that in our everyday business we are constantly contributing to a safer society. Which is the usual corporate crap. LT57 FMX has no right to park on the pavement or block a cycle lane. Selborne Road E17, June 26. G4S institutionally helps to damage pavements, illegally obstruct cycle lanes and generally act like yobs. No private motorist would get away with this. But G4S does. A valuable Field Guide to Toronto Cyclists. Well, I've been banging on for over a year about vehicles in the Town Square pedestrian zone and the need to replace all the bollards. And by an amazing coincidence last week these bollards were installed at the Selborne Road end, with more new bollards by the cycle stands, and yet more bollards at the High Street end. Drivers can no longer use the Town Square as a rat run or for free parking. Does this mean that someone in the Council is reading this blog? Wouldn't it be lovely to think so. But one niggling anxiety remains. Has the Council really thought this through? With these new bollards, how will the mayoress get to the shops? Obstruction of the footway, by the contractors who are levelling the notorious Arcade site in Walthamstow, for purposes unknown. Hoe Street. As can be seen, it's now not even safe to cycle on the pavement here. Either that or this individual has failed to master the simple skill of cycling with one hand while holding a guitar with the other. And now I think it's time to have a drink and a rest on this comfy chair thoughtfully placed on the cycling 'quiet route to Chingford' - the bit that runs alongside the Ching, which incidentally overflowed on Saturday after the torrential rain, leaving a carpet of mud across the cycle lane. First squalor pic Cairo Road E17, next two Milton Road E17. All pics taken yesterday. I was interested by the presentation and very varied interpretation of Friday’s official government 2008 casualty statistics for what are commonly described as ‘road accidents’. Firstly, designating road crashes as ‘accidents’ immediately begins the process of muffling understanding of them. The vast majority of road crashes are not unpredictable accidents but arise from the deliberate and criminally negligent operation of dangerous machinery. Almost all police forces and media collude with road violence by designating it accidental. The judicial system then perpetuates that false designation. Secondly, fatality and injury statistics do not represent the total number of crashes on Britain’s roads. Most crashes do not result in injury or death. To grasp the incredible scale of crashes on Britain’s roads you need to look at insurance claims arising from crashes. For example, this crash, which resulted in no personal injury to the driver but which would likely have killed a cyclist who was passing at the time, occurred on the very day the new statistics were released, and supplies a classic example. Thirdly, fatalities and injuries cannot simply be equated with danger or its absence. A road can be dangerous, with the result that few cyclists choose to use it. The absence of any record of collisions resulting in injury or death does not mean that a road is safe. But highway engineers choose to use ‘road accident’ statistics as proof of safety. Just look at the presentation. Violence on the roads is the greatest form of violence in Britain but you would never know it from the media. The reality is that 78 people die or are seriously injured on our roads each day. The well-funded road lobby dominated interpretation of the 2008 statistics. As far as the RAC is concerned everything on Britain’s roads is wonderful, as is proven by the fact that deaths on the roads are the lowest figure since 1926 when records began. DRIVERS are at higher risk of crashing on Scotland's main roads than those in England and Wales, according to a government-based survey. The Road Safety Foundation said 17 per cent of A roads in Scotland were in the two highest-risk categories, compared with 12 per cent south of the Border. Joanne Hill, managing executive of Road Safety Foundation, said: "Scotland certainly has more roads in the medium-to-high risk category than the UK as a whole but, because they carry smaller volumes of traffic, it is harder to make the economic case for investing in them.We would certainly want to see greater investment put into the non-primary A roads which our research shows present the highest level of risk, accounting for 62% of all road deaths." That’s because the ‘Road Safety Foundation’ is a road lobby front. It is not interested in reducing road danger but in seeing millions more spent on building new roads or ‘improving’ existing ones. THE death toll on Scotland's roads is at its lowest for nearly 60 years, new figures have revealed. THE number of children killed on Scotland's roads more than doubled to 20 last year. THE number of children killed in cars on Scotland's roads trebled last year to its highest level for 21 years, Scottish Government figures show. The increase from four to 13 since 2007 comes despite stricter laws on child car seats – which surveys suggest are incorrectly fitted in up to two-thirds of cases. That last comment is classic bad science, because it suggests a connection between an increase in children killed as car passengers and child car seat fitting. But no connection whatsoever has been established between the 2008 figures, child car seats and child passenger deaths. The linkage is every bit as spurious as those stories which tell us that a cyclist who has gone under the wheels of a heavy goods vehicle ‘was not wearing a helmet’. The Campaign for Safe Road Design claims 10,000 deaths or serious injuries could be prevented over 10 years by using better signs, lines and kerbs. The road lobby had a field day. 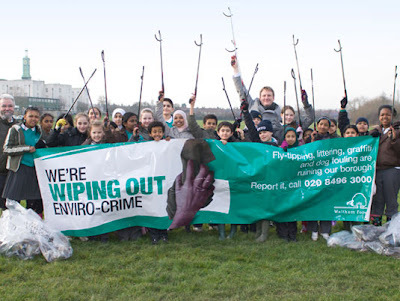 Its bogus Greenwash fronts - The Campaign for Safe Road Design, The Road Safety Foundation, and EuroRAP - were widely cited, as if they were somehow official and objective organisations, rather than lobbying outfits with slick PR teams. And the Green movement? Nowhere to be seen. This dramatic drop coincided with a one per cent fall in traffic as a whole, while the number of cars on the road dropped by three per cent during a year when petrol prices peaked at 119.7 pence on July, while diesel hit 133.3 pence. Although prices rose into July, the cost of motoring fell in the second half of the year - and the number of deaths rose to 661 during the third quarter and increased again to 693 between September and the end of the year. Speed cameras, better in-car protection and tougher enforcement of the ban on mobile use by drivers have all been cited as being partially-responsible for the improved figures. the distance travelled by motor vehicles in 2008 fell around 0.8 per cent compared with 2007 – the first fall since 1979. In other words, there was less danger around, as the number of drivers on the roads dropped, and the distance travelled by vehicles also fell. Then, as petrol became cheaper again, there was a surge in road deaths. The number of [cyclists] seriously injured rose by 1 per cent to 2,450. The total casualties among pedal cyclists rose by 1 per cent to 16,297. So the CTC, which cherrypicks the reduced fatalities statistic, is clutching at straws in thinking that more cyclists on the roads makes the roads safer for them. My guess is that the figures for 2009 will show a surge in both pedestrian and cycling fatalities and injuries compared to 2008. I base this on my subjective impression that good weather brings out cyclists and walkers, and 2009 is turning out to be a much sunnier year than last year, which had a poor, cloudy, wet summer. If I am right in my prediction this will prove nothing, except that Britain's roads continue to be very dangerous places, and that these statistics register instances of exposure to risk, not 'safety'. And now here’s a 28 seconds-long clip of what it’s like to cycle on a London road which is 2.8 times safer than it was in 2000, in a country with the safest roads in the world! More bike vid news here. Arriving at night and looking down on the site, it resembles nothing so much as a vast industrial complex despoiling the Somerset countryside. Generators hum, arc lights blaze, cars choke the surrounding roads. The festival's carbon footprint, despite the Greenpeace bus that proudly announces it runs on discarded cooking oil, must be massive. A middle-aged man from the Daily Telegraph doesn’t enjoy Glastonbury. (Below) Why go to Glastonbury when you can camp out in the Town Square, Walthamstow? Enjoy regular weather forecasts from 'The Big Screen' and thrill to the sight of top anti-terror squads swooping on suspicious foreigners photographing double-decker buses. This beautiful camp site is perfectly located for the Red Cross Used Electrical Goods Shop, Poundland and Asda. I am getting very, very tired of these temporary signs, which I encounter regularly. Anyone who thinks a cyclist is going to dismount and push their bike for the next 30 metres is plainly delusional. But doubtless any cyclist knocked off their bike at this location by an impatient or reckless driver would be deemed to be guilty of substantial contributory negligence. And if they weren't wearing a cycle helmet, well, that would clinch the total innocence of the driver, would it not? 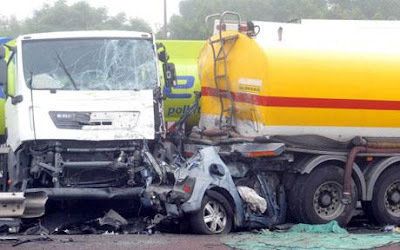 It is believed the first tanker braked in the dense mist and the car was shunted into the back of it by another tanker following behind, leaving the driver of the car fatally injured. In its critical analysis, released on Wednesday, the Sustainable Development Commission (SDC) warns that progress on a number of green targets has been "undermined by stasis or even reversion". Britain remains the EU's second-largest emitter of greenhouse gases and is not on track to meet its target of a 20 per cent reduction in CO2 emissions by 2010. Britain is one of the poorest performers in Europe in supplying energy from renewables and is not on track to meet national and EU targets. Britain has the highest rate of childhood obesity in the EU. Despite decreases in overall emissions of air pollutants, 20 cities fail to meet EU legislation for particulates, and the UK is at risk of missing targets for nitrogen dioxide levels. Between 1986 and 2003, the average number of trips by foot fell by 30 per cent. Road traffic volume has risen by 20 per cent since 1990, and the frequency of car journeys in the UK outranks walking, cycling and public transport. An Edinburgh cyclist has been awarded almost £6,000 in damages after suing Scottish ministers over a poorly maintained cycle path in Edinburgh. Lord Bannatyne heard that the cycleway, beside Queens Drive as it skirts round the Palace of Holyroodhouse, made a sudden change in direction. The surface also changed there from smooth asphalt to rough concrete and the path was only 1.8 metres wide - less than the recommended 2.5 metres. Mr Anderson had two good lights on his cycle but the lighting in the area was bad and there were no hazard signs to warn of the change in direction or lines to help follow the track, particularly at night. An off-road cycle lane alongside a hazardous 'A' road? Not in East Sussex. A spokesman for East Sussex County Council said, "We are keen to encourage cycling and work with others to explore opportunities to do so. However, we are focusing our efforts on the way people travel to work or to school as we believe short journeys of this type have the greatest potential for people to cycle. "To this end, we are continuing to maintain and promote existing recreational routes rather than building new ones." What’s this six-wheeler doing parked across the elegant dark brick pathway which leads from Walthamstow Central across the pedestrianised Town Square to the heart of the market? (Yesterday) Apparently it’s The Well-Being Wagon, the brainchild of the Peabody Trust. Peabody, along with other London housing associations, has been given £4.7 million from the Big Lottery Fund to set up Activate London, a group of projects aimed at promoting well-being. And how better to promote well-being than driving around London in a large six wheel vehicle? And what a lovely green colour! Millions of pounds are frittered away on Green spin and PR in a capital city where, to give just one example, cycle stand provision is laughably inadequate. The Well-Being Wagon is a custom-built mobile classroom with 10 ICT workstations and internet access via satellite – hosting a range of activities, mainly using video conferencing links with Wellbeing Centres to beam live sessions such as cookery demonstrations and nutritional advice to a Smart Board and PC screens in the Wagon. Residents will also be able to use the internet to access “Ask Peabody” - a data base with information on all local Wellbeing services and activities. Staff will help people to explore the internet for the many healthy living websites world-wide for information on recipes, exercise, and alleviating stress. The vehicle is parked a few yards from the entrance to Walthamstow Library, which has got rid of most of its book stock in order to transform itself into an internet emporium. This wagon is not alleviating my stress. When I see vehicles parked in pedestrian zones my blood pressure rises. I have to go for a ride on my bicycle to calm down. But on the streets round here that just leads to more stress. A written answer to a question put to the Mayor by Jenny Jones last month revealed that £52 million of the £111 million cycling budget for the 2009/10 financial year has been allocated for the bike hire scheme. Talk on the grapevine is that the cost of operating Boris's bike hire scheme looks like being significantly higher than that £52 million in the budget. “The lorry driver caused the accident by recklessly overtaking me too close, too fast, in the circumstances with the oncoming traffic and leaving me with the choice of either going under his wheels or leaving the road. Shocked beach-goers told the Daily Echo how they saw officers setting up a makeshift trap to apprehend a male cyclist yesterday afternoon. It followed reports that seafront manager Chris Saunders had been involved in an alleged incident with a cyclist after asking him to slow down. “There was one police van, three cars and two woman officers on bikes. There was a commotion and I looked through my binoculars to see them stop this guy and put him into a van. The driver, who ‘lost control’, was 89 years old. 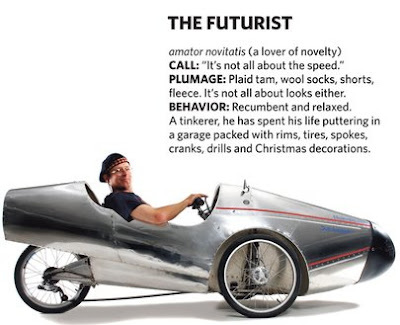 Under the current system, designed to get as many people driving as possible, the only person who has to verify that a driver older than 75 is fit to drive is… the driver. Tim Davie made a rail claim of £49 to make a return journey on different train to the one booked on in November, 2008. In September, 2008, he took a taxi to his car, costing £10. It was at the Albert Hall. Bristol Traffic quite rightly draws attention to the danger posed by cyclists using mobile phones. I myself recently encountered this dreadful example of a cyclist riding along with only his right hand on the handlebar, in the middle of Piccadilly. His left hand held a mobile phone to his ear and he was engaged in conversation. Worse still, just look at that unsuitable hat. What kind of protection does that offer in the event of a collision? Look carefully and you will see that only one of the cyclists in this photograph is wearing British Safety Standards approved headgear. Shocking. Someone needs to get to the bottom of this. A survey of more than 450 cyclists by the London Assembly found that 77% rated bike parking facilities as poor. Labour Assembly Member Joanne McCartney, who led the investigation, said: "In virtually every area, from new residential developments to mainline stations, the situation was the same. There is not enough secure cycle parking in the right places to meet the soaring demand in London." She's right. Just take a look at this. (Below) This bike frame, which has been here for many months, continues to clog up a cycle stand in the Town Square. Maintenance of bike stands is just about non-existent. Yesterday. Dozens of love letters from singer Edith Piaf to a French cyclist, in which she describes her sexual fantasies and vows to quit drinking for him, fetched 55,000 euros ($77,400) at auction in Paris on Thursday. Piaf, almost as famous for her many love affairs and addictions as for her songs, wrote the previously unseen letters to championship cyclist Louis Gerardin in 1951 and 1952, dedicating her song "Plus bleu que tes yeux" to him. In her letters to Gerardin, she mixes that passionate love with sexual desire, praising the cyclist's thighs and buttocks. Gerardin himself reportedly said of his mistress: "Forty eight hours with Piaf are more tiring than a lap in the Tour de France". It's good to see that health and safety has not been overlooked and everyone in this picture has remembered to wear protective headgear. The government will "definitely not" proceed with a national road-user charging scheme if it wins the next election, the new transport secretary has said, in the most comprehensive renunciation so far of a policy adopted in 2004. In his first big speech since his appointment in the cabinet reshuffle on June 5, he outlined a position likely to disappoint the many transport lobby groups that were already dismayed by the stance taken by Geoff Hoon , Lord Adonis's predecessor. The 2006 Eddington report on transport policy said a national road-user charging system could provide benefits of £28bn a year by 2025. AA president Edmund King welcomed the climb down yesterday. 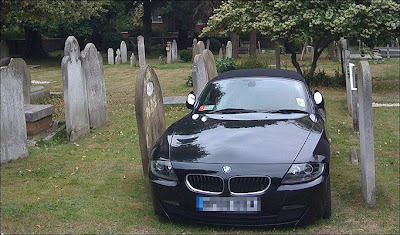 St Mary's Church in Wimbledon Village, south-west London had been charging £20 a day to park in its cemetery. Speaking to BBC London 94.9FM, Melanie Allcock from Balham, who parked in the cemetery, said: "We were told: 'Go and reverse between these gravestones'. "I thought: 'This is very odd'. But we did it and went to Wimbledon." Fair enough. How else could one possibly travel from isolated Balham to a remote, faraway region like Wimbledon other than by car? The Church of England has a marvellous record locally, as it does nationally. Here’s an inspiring example of a church on Exmoor which is passionate about supplying vehicular access. In a spirit of open-minded scientific enquiry I went back to the site on Hoe Street E17 to see if I could understand why the driver of a heavy goods vehicle strayed into the cycle lane, coming dangerously close to me. I think I was just beyond the black litter bin in the photo below (just beyond the first tree on the left) when the lorry driver veered into the cycle lane. The problem here is that although the dashed white line in the centre of the carriageway runs in a straight line, the cycle lane markings curve to the right, following the line of the kerb. The carriageway actually narrows just at the point where drivers are forced to move left. Smaller vehicles like the white van feel no need to enter the cycle lane, but drivers of bigger vehicles plainly do. In the photograph below, a car moves across the cycle lane to get into the left hand lane. What is to be done? The traffic island needs shortening, which would allow the dashed white line in the centre of the carriageway to run further. This would encourage HGV drivers to move left further down the road, not at the very point where they come into conflict with a cycle lane. Ideally, the borough's near-invisible cycling officer should be made to pedal repeatedly down this stretch of cycle lane until she has experienced and understood the danger its design poses. Later today the official government statistics for road deaths and injuries will be published. The number of fatalities will probably have fallen. An airhead minister will be wheeled out to say that Britain has some of the safest roads in the world. No car supremacist journalist (and certainly not one from the BBC) will challenge the meaning of these statistics. As they only record deaths and injuries the figures will exclude most crashes on Britain's roads, since most result in no recorded injury (such as the recent Boris near miss lorry episode). In no meaningful sense will they indicate anything about safety or danger on the roads. You can be quite sure that the minister will not be asked why the government has not introduced an immediate driving ban for anyone caught using a mobile phone while driving. The answer is, of course, that the solution to road carnage is political, and all the major parties have cosy links with the road lobby. A few hundred dead and injured cyclists and pedestrians is a small price to pay for keeping the mobile phone companies and the motor trade happy. In reality any fall in casualty statistics will in part reflect a reduction in traffic volume in the face of recession and high fuel costs. Other factors include air bags and rigid steel safety cages, which protect people in cars from the consequence of crashes. The air ambulance whisks victims of road crashes to hospital. The roads are no safer; it's simply that people who would once have died now live. And traffic congestion, by forcing drivers to go slowly, also helps reduce fatalities and injuries. Average speed cameras also curb lawless risk-taking driving. More than half of Britain's A roads have failed to be rated as safe in a study of 28,000 roads and motorways. A quarter of motorways also rated poorly, the European road assessment programme (EuroRAP) found. EuroRAP is a road lobby group. Its website has to be scrutinised with care. For example, ‘Road Peace’ (sic) is correctly listed as a victim support site but has nothing at all to do with EuroRAP. The EuroRAP solution to road carnage is to spend more money on roads. It is not remotely interested in speed limiters, or black boxes in vehicles to record speed at the time of a collision, or limiting vehicles to maximum national speed limits. Like all such bogus road safety organizations its reports reveal a pattern of systematic neglect of pedestrians and cyclists. EuroRAP exists to deflect attention from the true causes of road carnage – reckless criminal driving and vehicles cynically designed to encourage reckless speeding. Any cyclist knows that Britain’s roads are not safe, and criminal and reckless driving is a very visible reality. Drivers know that the police have little interest in curbing their risk-taking. All the road ‘improvements’ in the world are no protection from the yobs who clog our road network. People like this character: Shennan continued to overtake even after the end of the dual carriageway, travelling across the chevroned lines in the centre of the carriageway. John Chambers, 49, was over the drink-drive limit and was wanted for breach of bail when he careered across Emm Lane, Heaton, causing the devastating crash. Chambers, of Bradford, admitted inflicting grievous bodily harm on Karamat and Rubina Bi, dangerous driving, driving while disqualified, having no insurance and driving over the alcohol limit. At the time of the crash, Chambers had failed to answer court bail in Manchester after a 20-mile police chase on December 1, 2007. He was on the run for dangerous driving, driving while disqualified, having no insurance and driving with excess alcohol. He had been banned from driving for five years by Calderdale magistrates in May 2005.
banned Chambers from driving for ten years and ordered him to take an extended test before he gets back behind the wheel. And now spot the difference. However, as the song says, I ain't ever satisfied. I mean, just look at that clutter. Each cycle lane contains two black bollards, which is bloody daft. Okay, it's necessary to stop naughty motorists trying to get through but this is good enough to stop a Panzer Division in its tracks. Six out of ten. Oh alright, then. Seven. (Above) The notorious derelict EMD cinema on Hoe Street, Walthamstow. The borough's last cinema, until it was bought by a wealthy evangelical group, who wanted to turn it into a place of worship. Planning permission was refused. The Council prefers not to get involved. And this listed building continues to rot. (Below) Now showing: The Squalor from Waltham Forest. (Below) Aftermath of the latest demonstration. The derelict cinema lies just a short distance from the notorious derelict Arcade site on the corner of High Street and Hoe Street. Both sites have attracted a great deal of attention locally. One overlooked site on Desolation Row is this (Below) Just beyond the derelict cinema, on the corner of Milton Road and Hoe Street, is this magnificent nature reserve. A couple of years ago the Council gave planning permission for a new housing development. The existing buildings here were demolished last year. And then the banks started going bust, the recession kicked in, and property development began to freeze up. Now a sign has gone up that says TO LET. It's hard to imagine who will would want to rent this site in the current economic climate, so presumably it will remain empty for the foreseeable future. (Below) In the background there's a billboard showing the glories of a Lexus Hybrid. The sort of car that nobody round here could possibly afford. Watching the watchers... Who's this beyond the first red light on Willow Walk E17, blocking the way for High Street pedestrians crossing at green? Why, it's one of the London Borough of Waltham Forest enforcement Smart Car CCTV vehicles! Last Saturday afternoon. Easy enough to understand what happened. Traffic backs up from the next set of lights at the junction with Selborne Road. Impatient and inconsiderate drivers crawl across the High Street junction at green, join the back of the queue, then get stuck there when the lights change. When the lights change to green for pedestrians, their way is blocked. Every Saturday, and at other busy times, you see this crystal clear example of the idiocy of Waltham Forest's top highway engineers. This shambolic situation could be prevented by painting dashed yellow markings across the speed table, making it an offence to stop there. There's even room to park an off-road Smart Car CCTV vehicle, which could catch its colleagues! You'd think that the three High Street ward councillors would occasionally take a stroll down the High Street and notice the sort of things this blog notices. (Below) To be fair, parking enforcement in Waltham Forest is generally good, but there are inconsistencies. For example, the Council's parking enforcement team turn a blind eye to the numerous and regular offences committed on the pavement by scooters parked in front of the pizza takeaway at the St James Street end of the High Street, at the junction with Pretoria Avenue. Bike Week Day Seven: fun, fun, fun! Safety mirrors at major London junctions?